Former NM Gov. Bill Richardson tells Candy Crowley that Obama deserves credit for pushing for the DREAM Act. Is Sandusky's adopted son a victim? Jerry Sandusky's adopted son Matt Sandusky now says he was also a victim of abuse. He contacted lawyers and said he'd like to meet with prosecutors. How do YOU think the Sandusky trial will turn out? Arturo Vargas, Executive Director of the National Association of Latino Elected and Appointed Officials, explains what strategies are needed for Romney to win over more Latino voters. Did YOU think Romney's speech today to the NALEO was effective? John King and Sen. Charles Grassley, (R) Iowa, talk about the Fast and Furious investigation. They discuss the contempt vote against Attorney General Eric Holder today in a House hearing and why Preisdent Obama invoked his executive privilege in the matter. John King and Rep. Barney Frank, (D) Massachusetts, discuss the hearing today with JPMorgan CEO Jamie Dimon and also talk about the Dodd-Frank legislation. David Gergen tells John King about the state of the relationship between President Obama and Russian President Vladimir Putin. John King and Richard Quest discuss the Greek elections and what that may mean for the Euro-zone. Plus, they talk about who we should be looking at next as a possible problem for the Euro-zone economy. (CNN) – "Uninformed, arrogant, naive." Sen. John McCain used those three words in an interview Sunday to slam the Citizens United decision, the 2010 Supreme Court ruling that paved the way for political donations from corporations and special interest groups. Pressed on the issue of campaign cash and whether it is unduly influencing this year's presidential campaign, the Republican senator from Arizona maintained that allowing an "incredible amount of money" to enter political races opens the door for corruption. "I think there will be scandals associated with the worst decision of the United States Supreme Court in the 21st century," McCain said on NBC's "Meet the Press." The GOP senator suggested earlier Supreme Court benches would have ruled differently in the case. "That's why we miss people like William Rehnquist and Sandra Day O'Connor who had some experience with – with congressional and other races, with the political arena." Asked about Nevada billionaire and GOP financier Sheldon Adleson's recent pledge, along with his wife Miriam, of $10 million to the super PAC supporting Mitt Romney, McCain iterated it's the threat of not just one but many potential donors that hurts the electoral system. "The whole system is broken and it's a wash. I don't pick out Mr. Adleson any more than I pick out Mr. Trumka," McCain said, referring to the AFL-CIO leader who helped finance Obama's 2008 presidential campaign. "I've always been concerned about the labor unions who take money from their union members and without their permission contribute to causes they may not support," McCain continued. Casino owner Sheldon Adleson gained notoriety for backing former GOP candidate Newt Gingrich with more than $20 million in donations to the pro-Gingrich super PAC Winning our Future during the Republican primaries. Doubts about whether Adleson would eventually back Romney evaporated when he and his wife gave $10 million to the pro-Romney super PAC in mid-June. Since then, Adleson has made comments he may contribute as much as $100 million to the GOP presidential candidate. During the interview, McCain quickly shifted focus away from Romney's donors and toward what he called Obama's preoccupation with raising money for his re-election bid. "I'm concerned that the president continues to go around to all of these fund-raisers when maybe he should be spending more time governing," McCain said. 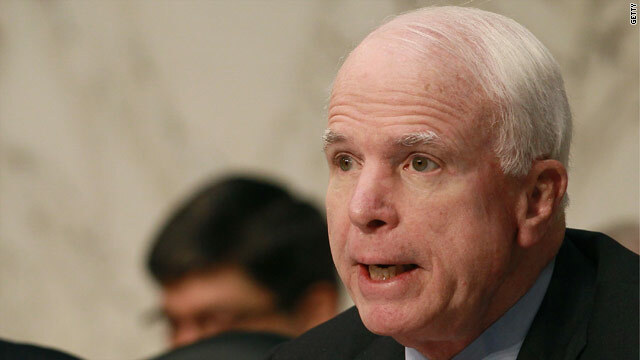 McCain took his criticism of the president back in time to the 2008 presidential campaign when then-Sen. Barack Obama opted out of $85 million in matching funds upon becoming the Democratic nominee. Obama vociferously rejected the public fund-raising money, claiming it would allow "special interests (to) drown out the voices of the American people." "And then (Obama) outraised me, obviously, by a great deal," McCain said, referring to the half a billion dollars Obama raised through grassroots campaigning. While he lamented current laws and their influence on the campaigns, McCain said he was hopeful current finance laws will eventually change. "The fact is that the system is broken," he said. "I predict to you there will be scandals, and I predict to you that there will be reform again." Focus Group: "President Obama is in trouble"
Democratic Strategist Peter Hart says "Pres. Obama is in trouble" according to a focus group he monitored. He tells JK that voters don't see a plan for the future. Sen. Ayotte tells John King that when Romney is president, he's going to need people like her to work with him. Do you think she'll have a run at VP?